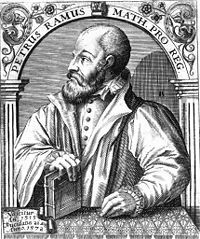 Petrus Ramus, or Pierre de la Ramée (1515 - August 24, 1572), was a French humanist philosopher, logician, and educational reformer, known for being an outspoken critic of the Aristotelian philosophy which dominated European universities at that time. He advocated a more natural approach to logic which would conform to the way in which the human mind actually approaches the world around it, and made a distinction between logic and rhetoric. Ramus objected to the way in which young students were made to memorize meaningless facts and rules of logic, and set out to reform the curriculum of the faculty of the arts into one that would teach students to use reason to advance their knowledge. He advocated the “freedom to philosophize,” maintaining that the use of reason would eventually lead a person to discover the truth. He emphasized the study of the humanities and held that each art had its own natural principle. Although Ramus was known for Renaissance anti-Aristotelianism, he upheld what he called the “true Aristotle” and blamed ancient and medieval commentators for misinterpreting Aristotle’s original intentions. In 1561 he converted to Protestantism, and was brutally murdered by his enemies during the Saint Bartholomew's Day Massacre, which started on August 24, 1572. Petrus Ramus, or Pierre de la Ramée was born in 1515 at the village of Cuts in Picardy, France, a member of a noble but impoverished family. His father was a charcoal-burner. Information about Ramus' life comes mainly from scattered biographical notes in his own books and the account of his close friend and collaborator, Nicolas Nancelius. After losing his father as a young boy, Ramus worked for a short time as a foot-soldier and a servant before he gained admission at age twelve, in a menial capacity, to the Collège de Navarre. Nancelius praises his diligence and reports that he earned his living by helping other students of greater means and consequently slept hardly more than three hours a night, resulting in a painful eye disease (Nancelius, 178). Ramus was an outspoken critic of the Aristotelian philosophy which was at that time the authoritative philosophy in European universities. He became a Master of Arts at the University of Paris in 1536, allegedly taking as his thesis Quaecumque ab Aristotele dicta essent, commentitia esse ("All Aristotle's doctrines are false"). He began to lecture at the university, but was dissatisfied with inconsistencies in the curriculum and in the methods of teaching. In 1543 he published the Aristotelicae Animadversiones, a criticism of the old Aristotelian logic and Dialecticae Partitiones, a new textbook of logic, written in elegant, humanistic Latin. He was accused, by Jacques Charpentier, professor of medicine, of undermining the foundations of philosophy and religion, and the books were condemned by the University of Paris. The matter was brought before the parlement of Paris, and finally before Francis I, who appointed to a commission of five to hear a debate between Ramus and his principal opponent, Anthony of Govea. The commission found Ramus guilty of having "acted rashly, arrogantly and impudently," and prohibited him from giving lectures (1544). He withdrew from Paris, but returned soon afterward when the decree against him was canceled by Henry II through the influence of the cardinal of Lorraine. The curriculum of the University of Paris was controlled by the Church and strongly influenced by a scholastic tradition dating from the late Middle Ages. In 1529, to diminish the power of the Church over the university, Francis I had established several regius (royal) professorships and had also set up a special college with a more humanistic curriculum, the Collège Royal (later known as the Collège de France). In 1551 Henry II appointed Ramus to one of the regius professorships. Ramus preferred to call himself a professor of philosophy and eloquence at the Collège de France, where for a considerable time he lectured before audiences numbering as many as 2,000. Nancelius described Ramus as being tall, dark-skinned as an Italian or Spaniard, and proud of his bushy black beard. Once when the rector of the University of Paris ordered all professors to shave, Ramus obeyed but stayed at home until his beard had grown out again. He spent much of his time reading and writing or talking with friends, and ate and drank moderately. He bathed once a year, but washed his face and beard daily in a mixture of water and white wine. He was reputed to have had a very bad temper, but gathered many disciples around himself. Through his professorship he acquired a sizable fortune which he designated in his will to establish an independent chair of mathematics, similar to the regius professorships, at the University of Paris. He published fifty works in his lifetime and nine appeared after his death. In 1561, Ramus renounced Roman Catholicism and converted to Protestantism. He had to flee from Paris, and though he found an asylum in the palace of Fontainebleau, his house was pillaged and his library burned in his absence. He resumed his chair after this for a time, but in 1568 the position of affairs was again so threatening that he found it advisable to ask permission to travel. In Heidelberg, where he had been promised a chair by the Count Palatine Fredrick III, the other professors refused him. He also tried unsuccessfully for an appointment to a chair in Strasbourg. In 1570 he returned to Paris and took up his former position as regius professor, but was no longer permitted to deliver lectures. Although the king had ordered that he be spared, Ramus was singled out by his enemies and murdered during the St. Bartholomew's Day Massacre, which started on August 24, 1572. On the third day he was taken captive in his study at the Collège de Presles, and his body was mutilated before being thrown into the Seine River. He became a martyr to his many followers. Fresh editions of the Partitiones appeared in 1547 as Institutiones Dialecticae, and in 1548 as Scholae Dialecticae; his Dialectique (1555), a French version of his system, is the earliest work on the subject in the French language. Ramus’ anti-Aristotelianism was most fully expressed during the 1540s and the early 1550s, when he formulated his ideas on logic. Dialectique (1550) provided a clear explanation of his aims. The following year he published the same book in Latin under the title Dialecticae libri duo (henceforth Dialectica). Hundreds of editions of the Latin version were published; it was later printed in many different languages, and used at schools and universities throughout Protestant Europe. In the late 1550s and the 1560s Ramus published his lectures on the various arts, including mathematics, physics and metaphysics. These were later published as Scholae in liberales artes in a Basel edition of 1569. During his final years he wrote a book on Christian theology, the Commentariorum de religione Christiana libri quatuo, published posthumously. Ramus defined theology as the art of living virtuously, ars bene vivendi, adopting the view that theology can teach us how we should live but cannot bring us salvation. The logic of Ramus enjoyed a great celebrity for a time, and there existed a school of Ramists boasting numerous adherents in France, Germany, Switzerland, and the Netherlands. As late as 1626 Francis Burgersdyk divides the logicians of his day into the Aristotelians, the Ramists and the Semi-Ramists, who endeavored, like Rudolf Goclenius (the Older) of Marburg and Amandus Polanus of Basel, to mediate between the contending parties. Ramus's works appear among the logical textbooks of the Scottish universities, and he was not without his followers in England in the seventeenth century. There is even a little treatise from the hand of John Milton, published two years before his death, called Artis Logicae Plenior Institutio ad Petri Rami Methodum concinnata. Petrus Ramus became famous for challenging Aristotle's undisputed primacy in the medieval university curriculum. Ramus was concerned with making education more meaningful and useful by reforming the curriculum of the faculty of arts. His attack was against scholasticism, rather than against Aristotle, whom he considered to be the most important logician. He blamed the ancient and medieval commentators for having misinterpreted Aristotle’s original works for centuries. He was insistent on pointing out the difference between what he referred to as the "true Aristotle" and the "false Aristotle." Ramus contended that, because Aristotle’s original works survived only in fragments, the commentators on Physics and Metaphysics had mistakenly included issues which rightfully belonged to logic. Ramus did not share the view of those who attacked Aristotle because he was a pagan. Ramus criticized the scholastics for philosophizing, not in order to discover truth and expand knowledge, but to demonstrate their mastery of Aristotelian philosophy. He accused them of having blind faith in the authority of Aristotle, and of subordinating their own reason in an attempt to conform. He pointed out that Aristotle himself was not afraid to challenge the views of his predecessors. He and his followers called themselves Socratics, because of the way in which Socrates led his students to question established beliefs and concepts until they arrived at a new understanding of the truth. Ramus wanted to see scholars use logic to expand their knowledge in various fields, and maintained that there was no danger in allowing men to think freely, since doing so would ultimately direct them to the truth. He contended that it was more dangerous to rely on someone else’s authority rather than exercising reason to arrive at a correct understanding. “Aristotle philosophized with the utmost freedom and, for the sake of the truth, he held views with utter freedom, against the entire tradition of the past, including his teacher Plato. And he practiced the art of logic not only in short debates but also in continuous disputations, in which both sides of the question were discussed. It was, in fact, his interpreters who rejected the freedom to seek and defend the truth” (Ramus, Scholae, in Scholae in liberales artes, col. 29). Like other humanists, Ramus often made fun of the meaningless rules and facts that young students were required to memorize. He maintained that there was no point in memorizing rules unless the students also learned how to use them to further their understanding and reach scientifically correct conclusions. Ramus’ most enduring contribution to logic was in opening up the fields of science to academic study, and emphasizing clarity, precision, and practice, rather than in defining a new and original system of logic. His rhetorical leaning is seen in his definition of logic as the ars disserendi; he advocated a closer association between rhetoric and logic, maintaining that the rules of logic could be better learned from observation of the way in which Cicero persuaded his hearers than from a study of Aristotle’s Organon. Ramus distinguished between natural and artificial logic; between the implicit logic of daily speech and the same logic made explicit in a system and taught through a textbook. Ramus believed that students should learn logic by reading and practicing in the way a person naturally thinks and argues. According to Ramus, logic falls into two parts: invention (treating of the notion and definition) and judgment (comprising the judgment proper, syllogism and method). This division gave rise to the jocular designation of judgment, or mother-wit, as the "secunda Petri." He separated rhetoric (style and delivery, elocutio and pronuntiatio) from dialectic (inventio, iudicium and memoria), a radical departure from the scholastic view. Ramus systematized the arts according to his method, which stated that each art or doctrina should have exclusive rights to its own principles. He proposed a natural method which began with a generality and gradually narrowed the examination down to a particular object or event. He recognized, however, that in practice we often start with a particular event and arrive at the generality. He did not reject the Aristotelian epistemology, and agreed that experience and observation were the basis for the principles of every art. There were three aspects of every art which needed to be examined: nature, principles and practice (exercitatio). Practice was the most important because it demonstrated whether the principles of the art were correct and therefore constructed according to nature. In his analysis of the syllogism, Ramus admitted only the first three figures, as in the original Aristotelian scheme. In his later works, following the precedent of Laurentius Valla, he also attacked the validity of the third figure. Ramus also set the modern fashion of deducing the figures from the position of the middle term in the premises, instead of basing them, as Aristotle did, upon the different relation of the middle to the so-called major and minor term. Ramus was a brilliant and effective writer, and his lectures were famous. During his career he attracted a number of loyal followers and admirers, and his works influenced the curriculum of many European universities, where his books acquired an impressive reputation in the sixteenth and seventeenth centuries. Ramist logic was particularly influential Protestant Switzerland, Scotland, and much of Germany. From its English stronghold at Cambridge it affected Francis Bacon, John Milton, and others. Among the "Ramists" were the Englishman, William Temple, and the Germans, Sturm, Freige, and Fabricius. His opponents at the University of Paris, Wittenberg, Helmstadt, and elsewhere, were called Anti-Ramists. For a time, his attack on Aristotelianism appealed to the Anti-Aristotelians of every country in Europe, who sometimes incorrectly regarded him as an ally. His influence faded during the seventeenth century, though some writers find evidences of it as late as 1662 in the famous "Port Royal Logic." Miller, Perry. The New England Mind. Cambridge, MA: Harvard University Press, 1939. Owen, John. The Skeptics of the French Renaissance. (original London: 1893); University Microfilms, 1969.